The first step in creating a nature inspired garden space is to find your inspiration. 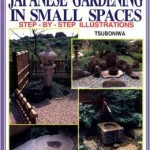 Some sources of inspiration could be other gardens such as a public Japanese garden or arboretum. Perhaps a photo in a magazine or book could inspire your design. I have a novel idea, how about using a natural area as the inspiration for your nature inspired garden? Could a Hike lead to a Nature inspired garden in your yard? 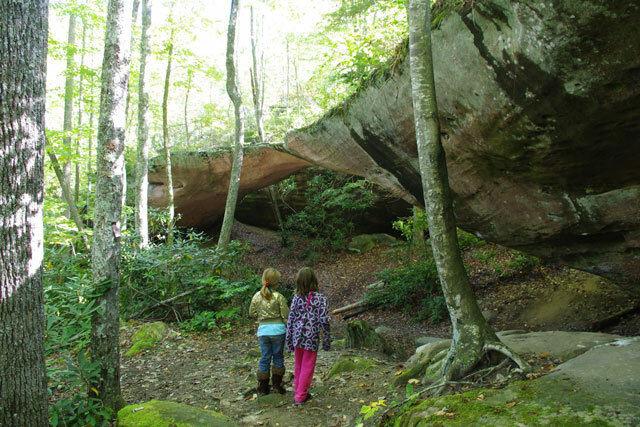 A couple of weeks ago, I took my daughters to a cabin at Pickett State park in Northeastern Tennessee. I have been to Tennessee before, including a trip to the Nashville area this spring. I have not spent much time in the eastern side of that state. I must say I was blown away by the beauty of the area. Short hikes into the woods of the park revealed amazing landscapes. To hear the “Woooow!” from my youngest daughter Kristin as we came upon our first sighting of the many natural stone features, deep into the natural bridge trail instantly brought a big grin to my face. of course they would prefer blonde haired children as they were Black bears after all and they wouldn’t want to eat their own kind. The next day, I had to convince two tired girls that we were going to go on a longer hike. That day we went on the Ladder trail hike. This one was rated as Medium difficulty as opposed to the previous days “easy” hikes. After we finally got going, they were even more excited by what they saw. Even larger stone features and “caves” awaited our exploration. Very cool mosses that we all couldn’t help but touch. This turned out to be the highlight of the vacation for my girls. I think they were truly impressed with what they saw in Tennessee. I was equally captivated by a detail that was not picked up on by my girls. It was something that got my mind going. All kinds of mosses, some familiar, some new to me. Upon reflection, I let my mind wonder what kind of wonderful naturalistic woodland garden could be created in the environment and soils of the area. Could the feeling of these woods be recreated in a much smaller nature inspired garden in a residential yard using these very plants arranged deliberately. Not 19,000 acres but instead 1/3 of an acre. If so what would it look like? Of course, I don’t live in Tennessee (yet?). So I doubt I will get to try and create that nature inspired garden scene I was trying to imagine. 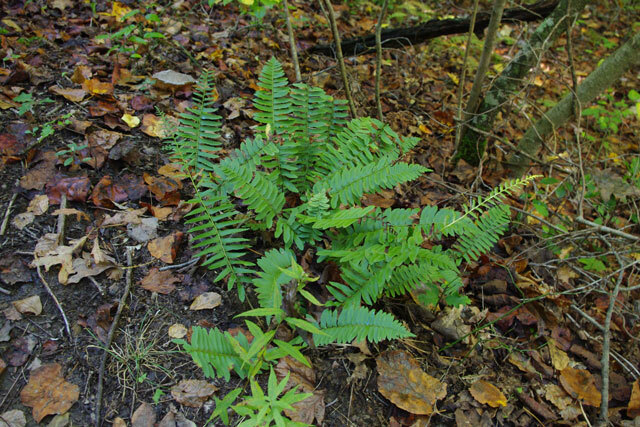 The acid loving plants so suited to this Tennessee woodland will not flourish in my Northern Illinois climate and soils. I could try and maybe get close. But even if I do, it won’t feel like it belongs here. 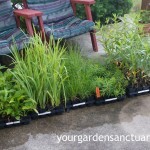 Unless you are trying to recreate a favorite natural area that you have visited in the past, such as a favorite childhood spot, one of the keys to making a nature inspired garden fit into the landscape is to use plants that are native to your area. For me for example that means not just native to the US, but native to northern Illinois. No not everything needs to be native, in fact there are some reasons to use some non natives for the longest lived of the garden plants, the trees. In general, however the more plants that are native, the more the garden will flourish. Not only should your plants be mostly native to your area. They should also coexist in the same type of natural area. 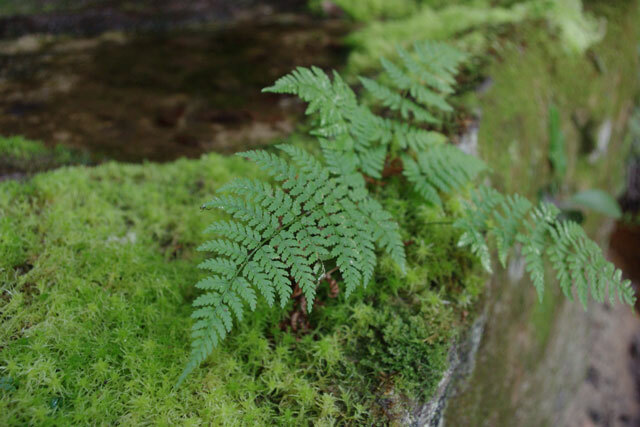 If you are trying to recreate the feel of a beech-maple forest don’t include wetland or meadow plants. 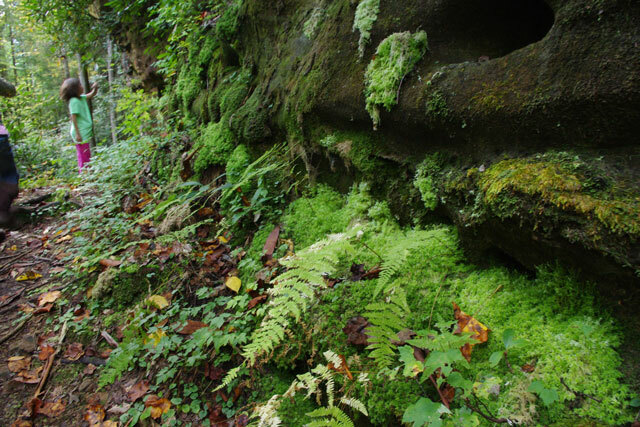 Limit yourself to plants that grow in forest areas (preferably beech-maple forests). Even if you have enough light for some nice ornamental grasses. Leave it out or at least put it somewhere else in your yard where it does not spoil the forest effect. 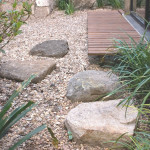 Not only should plants be local to the area, so should stones and other construction material such as path materials. If you live in an area of limestone, use limestone. If where you live is granite, use granite. Don’t use river rock in the desert! And don’t use lava rock unless you live on a volcano! So maybe my next hike into the woods should be a little closer to home. Perhaps a trip to a previously unseen to me park or forest in Northern Illinois or southern Wisconsin could inspire a landscape design. One that fits with and has plants that thrive with MY area soil and climate. Of course, I am also planning a spring trip back to eastern Tennessee to see all those Mountain laurels and Rhododendrons blooming! And who knows, maybe I’ll visit a few Open houses. Thanks for the tips. I will consider them when I go back next Spring. I work for myself in landscape maintenance for 11 years and have been in the field for 16 years, my passion is Gardening…….and Hiking, so I loved reading your story. I also love your insight. 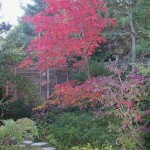 I have a customer that her entire landscaping in a wooded area is all Japanese gardening, she is quite experienced in pruning many different trees and shrubs to fit this Japanese scenery, I am most happy to have come across your website, it helps a lot when I have questions concerning her property. Thanks !!! !